Powerful SRAM Code RSC brakes – 200mm rotor (front), 180mm (rear). The Lunch Ride’s head tube angle drops down to 65 degrees, mostly due to the addition of a longer travel, 160mm Fox 36 fork with the ultra-capable GRIP damping system. The Fox DPX2 shock has been lengthened to provide six millimeters of extra travel (SB 136?). The bottom bracket also rises slightly, just enough to keep the crankset above the rocks. Wheels are DT Swiss M1700s – with aluminum rims reinforced with spoke eyelets. Those who want carbon can go for the $1300 USD upgrade, and have DT Swiss XMC 1200 wheels fitted. SRAM Code RSC brakes are another performance increase over the standard SB130, and stopping power is boosted further with a 200-millimeter front rotor (180mm rear). 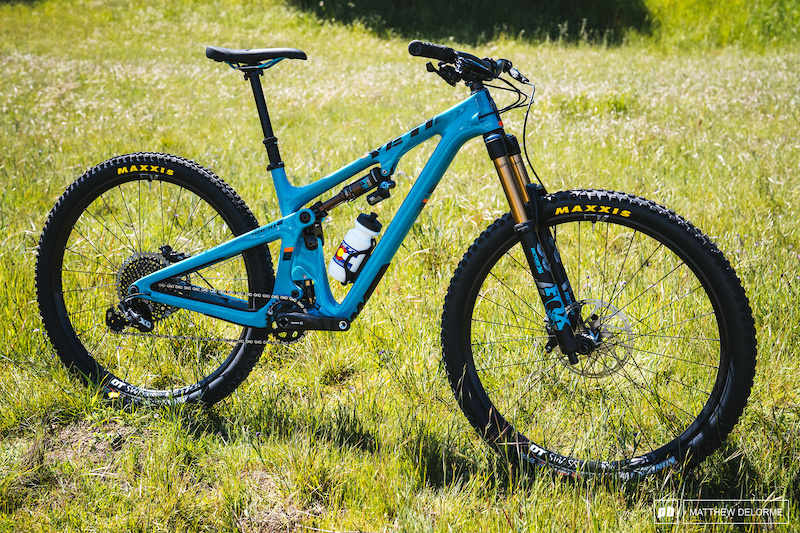 Yeti chose SRAM’s best performance value X01 Eagle drivetrain, this includes a lower geared, 30-tooth chainring to maximize the bike’s uphill performance. The extended shock increases the rear wheel travel by six millimeters, but the more significant benefit is that it alters the leverage curve to further enhance pedaling firmness near the suspension’s sag point.